This is a must-eat dish during Chinese New Year. 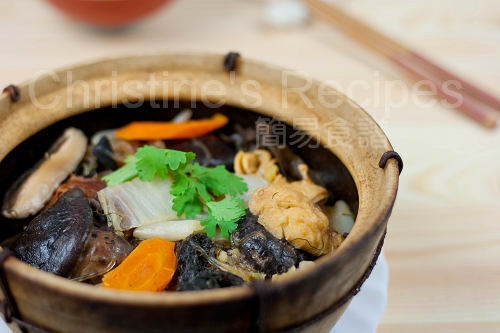 Needless to say, I grew up with this Braised Vegetables with Red Fermented Beancurd dish. 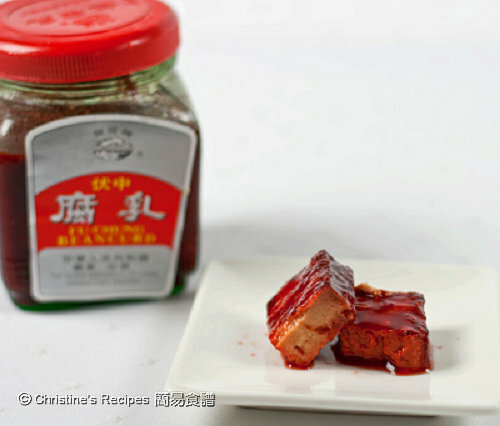 The red fermented beancurd is the soul ingredient to make all vegetables sing. During Chinese New Year, we’d have plenty of delicious snacks, desserts and great meals, including lots of meat, like chicken, pork, duck and fish - you name it, you have it. On the first day of Chinese New Year, my mother used to follow the Chinese tradition and prepare a vegetarian dish. It’s cooked in a large amount and kept in a large pot. Whenever a lunch or dinner is set on our table during Chinese New Year, this vegetarian dish would be served as a side dish as well. It seems to be a long, old tradition of having a meatless dish eaten on the first day of every lunar year. Some religious beliefs might be the cause behind. I have no idea of how this tradition came into place. Every kid who is brought up in a Chinese family gets used to eat this vegetarian dish on that day. I eat this dish simply because I like the taste though. In above picture, you see the traditional dried ingredients used in this dish, often cooked with Napa cabbage. Sometimes I'd add snow peas and carrots. You can use any vegetables you like though, and all the vegetables are cooked with red fermented beancurd, a creamy cheese-like delicacy which it’s seldom eaten on its own, often used as a marinade in Chinese cooking. 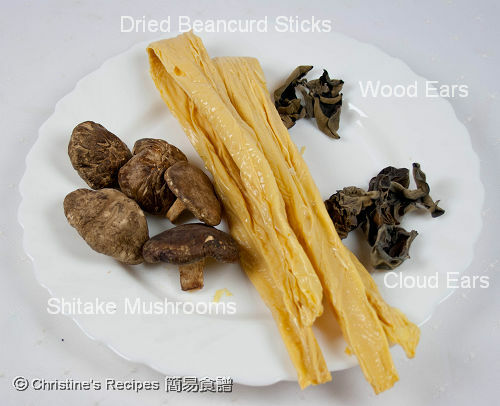 Soak shiitake mushrooms, cloud ears, wood ears, beancurd sticks and cellophane noodles in water until softened. Save the soaking water for mushrooms. Trim the mushrooms and cut into two halves if they are too big. Mix with marinade and steam in a wok for 20 minutes over high heat. Set aside. Trim cloud ears and wood ears, remove the hard stems. Cut tofu puffs into two halves. Blanch cloud ears, wood ears and tofu puffs in boiling water for 3 minutes. Drain well. Rinse Chinese cabbage and cut into sections about 4cm in length. Heat 2 tablespoons of oil in a wok or claypot over medium-low heat. Saute ginger until aromatic. Add red fermented beancurd paste and stir constantly, until fragrant. Toss in Chinese cabbage, increase heat to high. 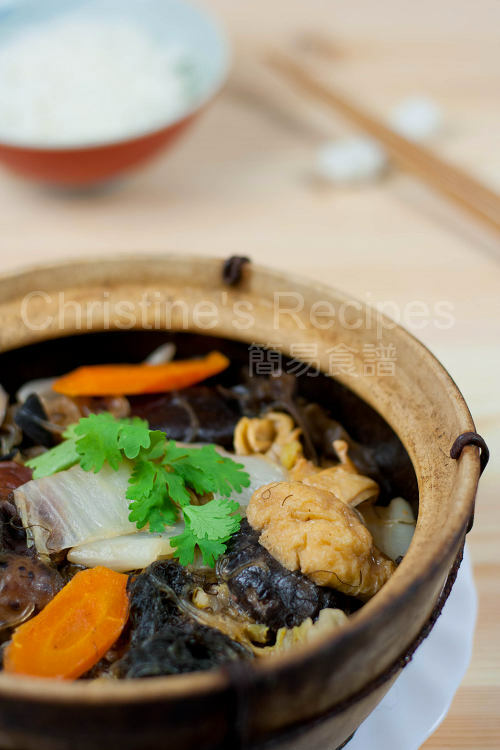 Add carrot, mushrooms, cloud ears, wood ears, beancurd sticks and 1 cup of water (include the mushroom soaking water). Cover and cook until all ingredients turn soft, stir occasionally. Check the water and replenish, if necessary, with boiling water. Add cellophane noodles, stir and cook until softened. Pour in thickening and cook to your preferred consistency. Serve hot. Cellophane noodles would absorb lots of water when cooking, add more water if needed. I used to marinate shitake mushrooms, then steam them before cooking with other ingredients. By using this method, the texture of mushrooms would turn to be tender and smoother. I learn this trick from my mother. She cooks every dish of shitake mushrooms with fabulous taste. Yes, as usual my mum will cook vegetarian dishes on first day of CNY and it is indeed very healthy to start a New Year ahead! I love this dish especially it is braised in a claypot. Wishing you and family a "healthy" & "prosperous" year ahead! This looks like from restaurant....beautiful and delicious. I love fermented beancurd...great with congee. Wishing you a very happy & prosperous Chinese New Year. That looks better than the one served in the restaurants..I love fermented bean curds. We do a similar braised vegetables (called Chap Chye) but I don't think fermented beancurd is used. I guess it is a different taste. Yes, tigerfish is right ... my family eats chap chye on the 1st day of CNY. But my version uses this fermented beancurd too :) It's really delish and I can eat loads! I agree about using cellaphane noodles. Sometimes, I substitute with enoki mushrooms instead. I love your presentation of this humble dish. Just give me a bowl of steaming hot rice and I'll be a happy girl! Happy New Year to you!!! The veggies sound fabulous with fermented beancurd! Such a healthy and nutritious dish! Happy Chinese New year! Nice shot! We always eat this during CNY, so good with rice. 恭喜發財！this is perfect for new year's day! I never realized about having a vegetarian dish after the New Year until an officemate told me. I was contemplating doing just that tomorrow and maybe will try your recipe - looks delicious. This is a wonderful dish and I make it every CNY. Normally served on the morning of CNY but out here, I just cook mine for our gathering for the Eve. Beautiful picture! Happy Chinese New Year! Happy Chinese New Year! Enjoy good health and happy cooking too! This healthy veggie my mum cook it every 1st day of CNY. Happy Chinese New Year! This could be our main dish as well, and I also like it to be served in a clay pot as yours. Happy Chinese New Year and Kung Hey Fat Choy! I love this dish! Thanks for the recipe! Thank you so much for this recipe. This is the kind of dish that my mum and grandma makes, but I have no idea how to make. I really appreciate your blog. Thanks for your recipe. I will try to make the dish on first day of CNY. Your recipe is such a great help to me.....very much appreciated. All the best for the Year of Dragon and Kung Hey Fat Choy! It's a must-have dish for CNY for my family every year. Thanks so much for dropping by and trying my recipes. Food is so amazing and it's related to our feelings and memories. Hope my recipes will bring up more of your childhood memory and pleasure. Welcome you to come back for more.